The United States of America, also known as the land of opportunity, is a country where people from all over the world want to visit. It is considered to be the, “Land of the Free” and the “Home of the Brave.” It is a beautiful country of rolling plains, vast seas, and tall, spectacular mountains. There is so much to see and do in this democratic country. • New York City: Tourists cannot come to the USA without visiting New York. New York is one of the most intriguing cities in the world. 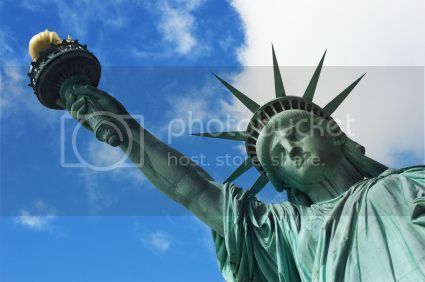 The Statue of Liberty is a symbol of freedom in the United States. Lady Liberty raises her torch for all to see. The skyline of Manhattan is breath-taking to anyone who sees it. New York, nicknamed the Big Apple, has people from all different cultures and personalities. There are so many things to do in New York, such as The Empire State Building, Times Square, museums, Broadway plays, Wall Street, and amazing nightlife. The list never ends. There are so many fabulous hotels that tourists wonder where to stay on their trip to New York. There is so much to see in New York that some people get a travel tour guide to show them the sites of the city. It is a true adventure to tourists. • Washington D.C: The Nation’s Capital is a remarkable city with a rich history. Visitors can go to the top of the Washington Monument, named after the country’s first president, or they can visit the interesting Smithsonian Museums. Other landmarks in Washington to include Arlington Cemetery, the Capital Building, or The Lincoln Memorial. Travelers can also get a glimpse at The White House, the home of the President of the United States. Washington is the center of the government in the United States. Many important decisions concerning the country are made in this historical city. • Las Vegas: Las Vegas, also known as Sin City, is captivating to visit. It is a city for those who love to gamble, but it also is home to vibrant nightlife, excellent shows, and mouth-watering food dining restaurants. It is a city to remember. • Los Angeles: This West Coast city is where many people come to get into the entertainment business. Visitors can see how the stars live, and L.A is in close proximity to great beaches, where tourist can see the great Pacific Ocean. • Miami: This southern city is a great place to visit to see remarkable beaches and take luxury cruises. Tourists can board a cruise ship and tour the Atlantic waters, or they can rent a car and visit the paradise which awaits them in Key West. • Chicago: Also known as The Windy City, Chicago is located on the Great Lakes. The city boasts a high standard of living and is one of the fastest growing cities in the world. • Boston: Boston is a city full of history. Visitors can see where the famous Paul Revere took his ride, or they can visit historical Bunker Hill. There is famous cuisine in Boston, such as the Maine Lobster or New England clam chowder. • Walt Disney World: Millions of people from all over the world visit this theme park in Orlando, Florida. It is a fantasy world that can make people believe that dreams really do come true. • The Grand Canyon: Anyone who loves adventure should see this wonder of the world. Located in Arizona, this gorge is 5000 feet deep and more than 200 miles long. Tourist will be amazed at the beauty of the natural wonder. It is truly awe-inspiring. • Hawaii: Hawaii was the last state to join the United States. Visitors love to visit this paradise. They can explore the sandy beaches or revisit December 7, 1941, a “Day that lives in infamy,” when they view Pearl Harbor. Hawaii is home to some of the world’s top resorts. The Aloha State will give tourists the vacation of a lifetime. • The Golden Gate Bridge: This Spectacular Bridge in San Francisco attracts tourists from all over the globe. • The San Diego Zoo: This is considered the top zoo in the country. Millions of tourists visit this popular attraction each year. Guests cannot visit the USA without seeing some kind of sporting event. All around the country at some point and time, there is some sport being played, whether it is high school, college, or professional. The most popular sport in the United States is football. It is called the “American Sport” since it is not played in any other country. People from all ages participate in the sport. One of the most televised events is the Super Bowl, which occurs in January. Baseball is considered the “American Pastime.” This sport has been played the longest of any American sport. Fathers and sons love not only to play this game together, but also they enjoy taking a trip to the ballpark to see a game in person. Other popular sports in the United States are basketball, hockey, tennis, and golf. Athletes in America are considered heroes to the American population. Sports in the USA are exciting to watch. In the USA, public education is funded by the government. Children from grade Kindergarten to twelfth grade are required to attend school. Families have the choice of whether to attend a public, private, or home school. The United States is also a great country for higher education or formal education. There are various types of institutions across the country. United States universities are top among educational choices. Many people from other countries choose to study in the United States because they can choose what subject to pursue, they get an outstanding education, and it is worth their money. Some of the well-known and prominent universities in the country include Stanford, Harvard, Yale, and Columbia University. • The Forth of July: July 4 is known to Americans as Independence Day. People from all over the country celebrate this national holiday. On July 4, 1776, the founding fathers signed the Declaration of Independence, which declared that the United States was an Independent country. Fascinating fireworks light up the sky on this historic day. • Macy’s Thanksgiving Day Parade: Every year on Thanksgiving, thousands line the streets of New York to see the fabulous floats and entertaining stars on Broadway. • New Years Times Square: Millions of people crowd into Times Square in New York City to watch the famous ball drop. Confetti is thrown, and people are kissing as Americans hope that the New Year brings new dreams. • The Rose Parade: Each January in Pasadena, people from all across the country witness the spectacular pageantry that comes with this wonderful parade. • The Sundance Film Festival: This cinema festival, which takes place in Utah, is a platform for new filmmakers to show their talents. • Mardi Gras: This tradition is one big party. People from New Orleans have a time of celebration. There are parades, family activities, and timeless traditions for people of all ages. When people travel to the United States, there are several travel tips that they need to keep in mind. The currency is the US dollar. Only a few banks and no hotels exchange foreign currency. When arriving in the United States, it is advisable to come prepared and bring US currency or traveler’s checks. ATM machines are very common across the country. Most shopping venues and other retail places accept most major credit cards, including American Express, MasterCard, Visa, Diners Club, or Discover. Individuals who travel to the United States on business need to have a nonimmigrant visa. The type of visa needed depends on the intent of the individual. People who seek employment in the USA will need a temporary worker type of visa. Other people who are in the country temporarily, such as an athlete, researcher, or speaker, will need another type of visa. When coming into the United States, individuals above the age of 21 may bring a certain amount of cigarettes or cigars, some alcoholic beverages, or gifts below $400 in worth. There are many modes of transportation. It is almost 3000 miles across the country, so air travel is very popular. People who visit the United States from abroad can find major airlines to get them to their destination. There is no departure tax. The busiest airports in the country are Hartsfield-Jackson in Atlanta, Chicago O’Hare, Los Angeles International, and Dallas/Ft. Worth International Airport. However, many people travel by train, bus, or the reliable automobile. There are many crossing points from Canada and Mexico into the United States. Greyhound also offers services to several destinations in Canada and Mexico. • Alaska: There is nothing comparable to a cruise to Alaska. It is just beautiful. There are dazzling glaciers to view, spacious shores, and high mountain peaks. Visitors will not want to forget their camera when they explore this gorgeous region of the United States. • The Bahamas: Just off the coast of Florida, the Bahamas have crystal blue waters and sandy beaches. Tourists love to take a cruise to see the sites of this paradise. • The Ritz-Carlton-Georgetown- Washington, D.C: This resort, built in historic Georgetown, has amazing architecture. It has fabulous rooms, including the luxurious Presidential Suite. Several landmarks are within walking distance, such as the Kennedy Center. • The Greenbrier- White Sulphur Springs, West Virginia: This was erected on the site of sulphur springs, where miraculous healings are said to have taken place. There are styles estate homes or individual rooms to choose from. • Walden Country Inn & Stables- Aurora, Ohio: This 5 diamond hotel has more than 20 luxurious suites where guests can relax and enjoy their vacation. There are many weddings and special events which take place at this resort. • The official language of the United States is English. However, Spanish is very common in households, as is French. • Flowers are very popular, and the National Flower is the Rose. Summer is considered the best time of the year to visit the U.S. The weather is nicer during this time of the year. However, many people choose to go to the United States after the summer holiday season, which would be in September or October. The weather is still nice and the crowds are fewer. Millions of people each year visit the United States. Americans are known for their friendliest to tourists. Dress is casual, and shaking hands is the usual greeting. Tourists love to explore one of the wealthiest and most powerful countries in the world. It is the opportunity of a lifetime.